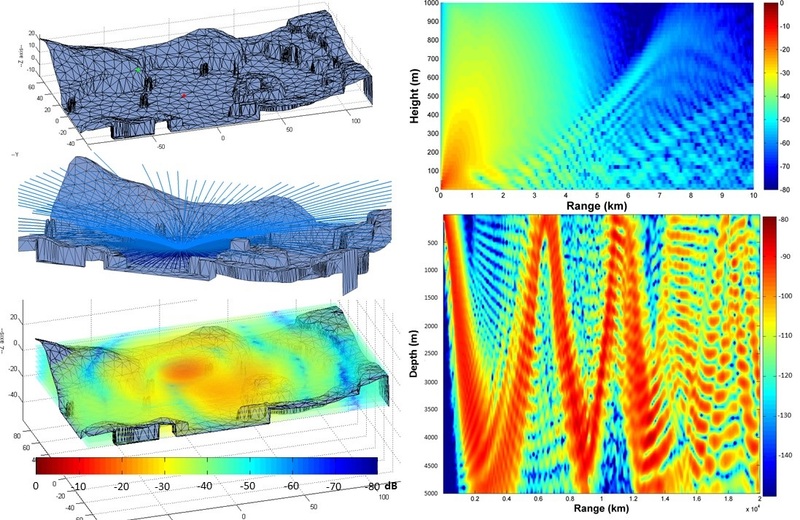 Outdoor Sound Propagation: We perform validation of 2D benchmarks for atmospheric (upper right) and ocean (lower right) profiles, and we demonstrate 3D acoustic pressure field computation running at close-to-interactive rate (left). Refractive media, in which light and sound propagate along curved paths, are ubiquitous in the natural world. We present algorithms that achieve efficient and scalable propagation computation for fully general media profiles and complex scene configurations. Our method is based on the geometric ray models, but we trace analytic ray curves derived from locally coherent media profiles as primitives. To facilitate high performance of ray curve tracing, we design the explicit cell data structure and algorithm for static scenes, and the implicit cell technique for dynamic scenes and moving media. Two orders of magnitude speedup is achieved in path computation over existing methods. Furthermore, we present efficient acoustic pressure field computation that matches the path computation performance. Our algorithms enable propagation simulation of large outdoor scenes that are not computationally practical with previous methods. Various components of our algorithms are also complementary to other propagation methods and can be extended in multiple ways. The physical world consists of spatially varying media, such as the atmosphere and the ocean, in which light and sound propagates along curved trajectories. This presents a challenge to existing ray-tracing based methods, which are widely adopted to simulate propagation due to their efficiency and flexibility, but assume linear rays. We make the key adaptation to refractive media by replacing a rectilinear ray with formulations of analytic curves, taking advantage of the local coherence in the media. By constructing an adaptive unstructured mesh as a spatial decomposition of the media, our algorithm is able to model general media profiles with complex boundaries in a compact way, which contributes to efficient ray curve traversal. We perform closed-form intersections with complex 3D objects given the ray curve formulations, and we also make embed the boundary surfaces of scene objects in the media mesh, which leads to boundary surface intersections that do not induce extra costs to traversal. 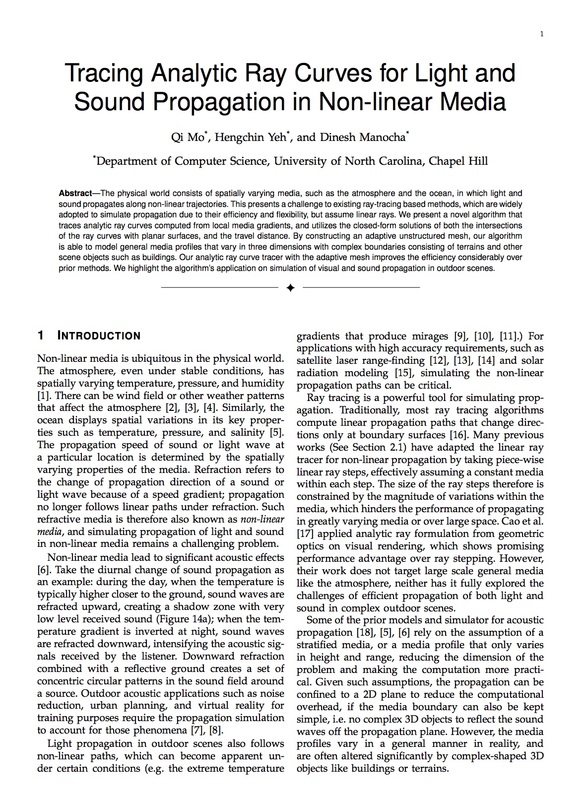 We highlight the algorithm's application on simulation of sound and visual propagation in outdoor scenes. For acoustic propagation with moving refractive media and dynamic scenes, the performance requirements preclude precomputation of data structures like the explicit cell mesh. In this work, a mesh-less approach is used for media traversal, tracing ray curve segments of adaptive sizes based on on-the-fly sampling of the media profile. This implicit-cell approach avoids costly mesh construction, and it supports moving media as well as dynamic media. The parabolic ray curve is selected as the ray-tracing primitive, which offers the simplest analytic form for trajectory, intersection, and ray properties. The hierarchical acceleration structures used in rectilinear ray tracers are adapted for the ray curve tracer. Further acceleration is achieved by spatial bounding of ray curves based on their geometric properties, which offers higher culling efficiency. Overall this algorithm is designed to be efficient for moving media profiles and dynamic scenes with tens of thousands of surface primitives. This method is also much more flexible, being complementary to a set of numerical and geometric methods and amenable to extensions in multiple ways. While path computation is a critical part of acoustic simulation and usually takes up a major chunk of the computation time, computing the acoustic pressure given those paths can also be expensive for large complex outdoor scenes, more so when the path computation part is significantly accelerated with our ray curve tracers. In this paper, an algorithm is developed that extends the performance improvement to field computation; it combines analytic evaluation of on-ray pressure based on the analytic ray curve formulation with pressure field computation based on the Gaussian beam model. The algorithm is validated against published results on benchmarks in atmospheric and ocean acoustics, and its application is demonstrated on a scene with terrains and buildings of realistic complexity and under a variety of atmospheric conditions. This algorithm is able to compute characteristic sound fields for fully general media profiles and complex 3D scenes at close-to-interactive speed.